The majority of the Kalhors are Shiites, while others are followers of the Ahl-e Haqq. khanmansoor eyvani kalhor, alikhan eyvani kalhor,Davood-Khan,abbaskhan,aliaghakhan azami Head Clans of the Kalhor tribe.eyvan-e-gharb is center of kalhor tribe. 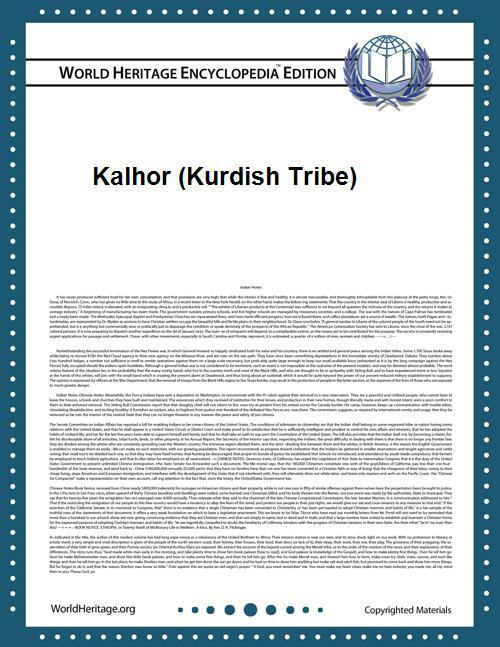 At the onset of new parliamentary government in Iran in 1906, the warlord Davood-Khan, Head Clan of the most renowned tribe in Kalhor didn’t obey the system. He invited the chiefs of the rival tribe, Sanjabi, to a gathering to establish a unity between the two tribes for a prospecting major assail against the government. In this gathering, Davood Khan asks a young man, the son of the Sanjabi's Head Clan to pick and bring some fallen leaves from under the trees. The same order is given to a 12 years old beautiful girl, Golzar, the daughter of Haji Khan Shirzad, Davood Khan's aide-de-camps. He then blends the two picks together, empties the lot in the running brook and says, "In the same manner that these leaves join and flow together, Kalhor and Sanjabi would join together for a march toward the Capital. The engagement ceremonies of this young couple will be put off to our victorious return from Tehran."